A couple of years ago, I read a book that changed the way I think. It changed my life actually. 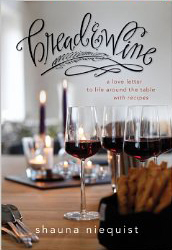 The book, Bread and Wine: A Love Letter to Life Around the Table, was written by Shauna Niequist. She put into words what had been simmering around in my heart for years. She talked about the sacredness of gathering your people around the table and sharing a meal together. I get that. There is nothing that stirs my heart like the connectedness I feel when my family and friends come together over a simple supper and share the details of our lives. I love cooking, I love eating and I love the people in my life. There is no greater way that I show my love for them than by feeding them. And feeding them feeds my soul.